Green clay: Naturally rich in minerals, wonderful for all skin types, and in particular for oily skin. Used regularly it delivers powerful rebalancing effects, absorbing excess sebum, gently cleansing, stimulating to the skin's defense mechanism and restoring new tone in the face.lating the skin’s natural defense mechanism and restoring new tone in the face. Intended for external use, the green clay mask is particularly recommended for oily skin types or for very specific applications. In the form of very thick plaster and poultice preparations, it can also be used to maintain and complete the results of SPA therapy. 100 ml (35 fl oz) tube. Convenient and easy to bring along. Apply green clay mask in a thick layer all over the face and neck area. Leave on for 10 min to take effect. Do not allow clay to dry. Cleanse with lukewarm water. Dry skin. 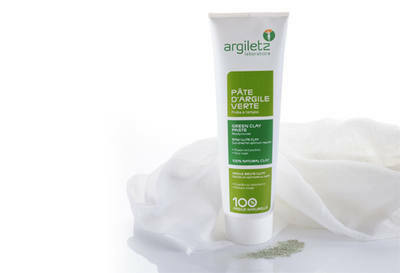 Apply Argiletz® moisturizing* day cream. This treatment is recommended for use once a week. Do not swallow. *Upper layers of the skin. Green illite clay 53% - Water 47%.